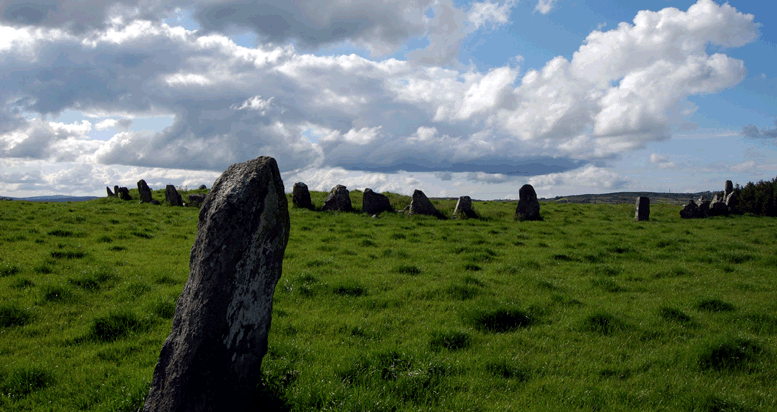 Beltany Stone Circle is located outside the town of Raphoe in County Donegal. It is made up of 64 large stones that enclose a low earth platform; it is believed there may have been 80 stones originally at the site. Stone circles like this one have been dated to the late Bronze Age period but their function still remains a mystery. It’s believed, however, they have been used for religious rituals that included observations of the sun and the moon. The Irish name Beltany is from ‘Baal Tine’ – ‘Baal’s fire’ and suggest that the pagan practice of sun worship was celebrated on this site. A stone head was found at Beltany that dates from the Iron Age period indicating this monument was still a place of ceremonial activity for centuries after it was first built. The site is also referred to as Beltony Stone Circle. From Raphoe in County Donegal travel south towards the village of Beltany. The area is well sign posted for the Stone Circle so its not difficult to find. There is a small car park beside a farm with a narrow muddy path leading up to the hill of where the stone circle is located. Its a few minutes walk.